Apple got its sh*t together! I’ve been a long advocate of Apple products but it’s the niggles that wind me up. That unified, perfect experience we strive to achieve in all manner of design. Apple have knocked it out of the park for several years now, but they started to lag. In response to the people disappointed with the new iOS7, my car has never run correctly since I bought it. The idle was iffy and the throttle response slow. I had to pay Ford £35 to update the ECU and now it runs a dream. I’m writing this as an initial reaction to #WWDC13 and the signs look promising. A good half of my colleagues and friends switched from iPhone to Android back when iOS6 was announced. It’s unassuming feature updates and lack of innovation just compounded the fact that it was falling behind Android’s updated interface and improvements with the experience. From being a dog to use, to catching Apple up. Both experiences weren’t perfect, and we’ve all heard the arguments for and against each operating system. The devil is in the details, and the experience has to unify between products and applications. I’ve been impressed by this years updated Air line and iOS7. 12 hours battery life is just mental from something so small and compact, and a complete overhaul of iOS seems like something a multi billion dollar company would never dream of. It’s both ambitious to attempt such a big user experience change, and bold to take on Microsoft and Android who innovated with radical design changes, even if Windows 8 ultimately failed on the overall grand scheme of things. Apple have fixed most of the niggles that have bugged me for a while now. “Siri, switch on Bluetooth”, “I’m sorry Mark, I can’t do that” is such a downer when you’re trying to hook up your car handsfree. 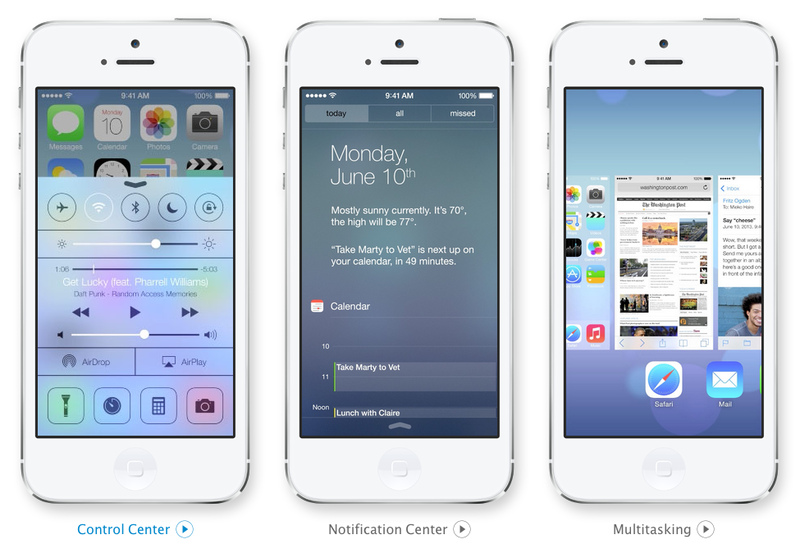 The new control center was also a great addition to iOS7. Android has had the ability to control toggles for a long time, and I even had it on a jailbroken 3G years back. From the updated animated clock on the homescreen (I saw it moving!!) to the ability to share items using Airdrop (emailing images to yourself just becomes tedious). I’m looking forward to trying out the new direction. Looks like I’m sticking with the iPhone after all. You get it right? It’s not just about colours, gradients and icons. It’s about how it is to live with. Unlike my car, this update is totally free. No catches, but like my car, it fixes a lot of niggles in one fell swoop.